The second major release of Galicaster Community, is available ! 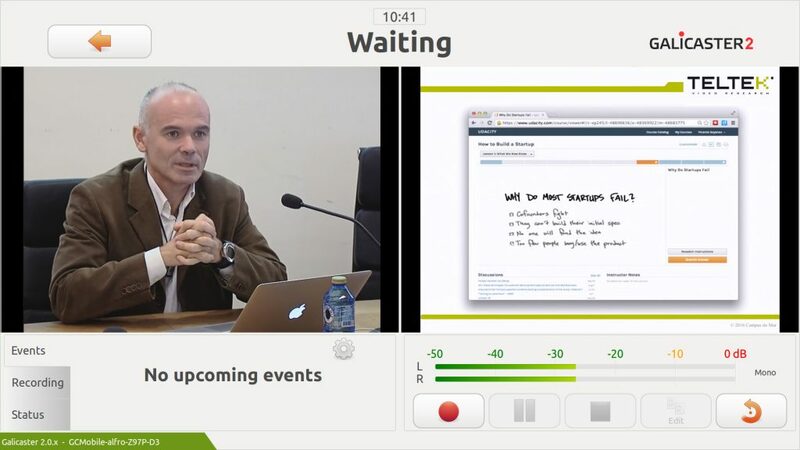 Galicaster is a powerful lecture and conference recording software. that, running on the recommended Hardware, builds a fully featured multi-stream recording unit. For the past year, we have been working hard at TELTEK to prepare the Galicaster 2.0 Community Edition. At last, we are glad to announce that the time has come for the release of Galicaster 2.0.0, the second major release of Galicaster. A more stable, efficient and bug-free software. Access to h264 hardware encoding. We have also moved our previous OS requirement from Ubuntu 12.04 to the Ubuntu 16.04 LTS release. This, although being mostly a consequence of migrating to GStreamer 1.x, comes with the perk of extended Ubuntu support for the next 5 years. A really big thank you to both institutions for their early interest in Galicaster 2. Media engine migration from GStreamer 0.10 to GStreamer 1.x. Base S.O. migration from Ubuntu 12.04 to Ubuntu 16.04. New external plugins architecture, plugins can now be loaded through pip or from a .deb package. Improved the Lock Screen plugin with LDAP authentication. New plugin to enable/disable inputs through a button or using the rest API. Added a dual-channel coloured VU-Meter (Mono or Stereo). Using CSS to “style” Galicaster. We are very excited about finally making this release for Galicaster 2. There are still many more features that we are eager to add, and we can’t wait to work on them during this year. We also believe this new release will make it easier for other people to contribute to Galicaster. We want to take care of the community, and continue working with you to keep making Galicaster better. If you have any suggestions, questions, etc, about Galicaster 2, feel free to open an issue on Github. Or drop us a line! As most of you know, from now on we will be providing a signed APT repository for Ubuntu. It will simplify dependency installation and will allow us to also provide external packages when required.